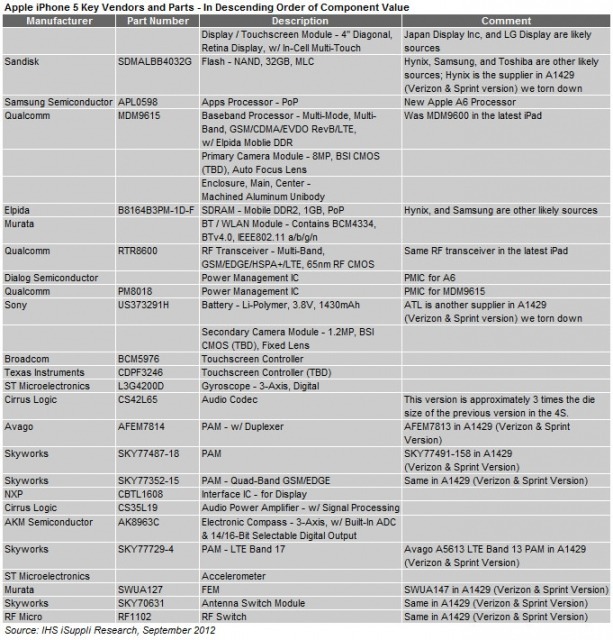 IHS iSuppli has released the results of their physical teardown of the iPhone 5, confirming a bill of materials starting at $199 and manufacturing expenses of $8. A physical teardown of the iPhone 5 confirms the bill of materials (BOM) and manufacturing cost reported last week in an IHS iSuppli virtual teardown. The low-end model with 16GBytes of NAND flash memory carries a BOM of $199.00, with the cost rising to $207.00, when manufacturing expenses are added in. 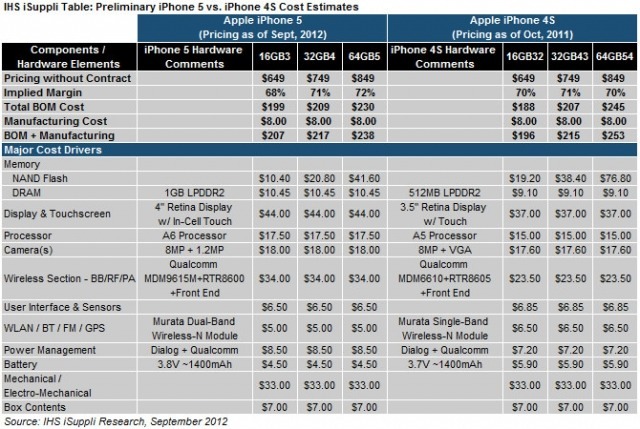 For the 32Gbyte version of the iPhone 5, the BOM cost increases to $209.00, while the 64Gbyte version is estimated at $230.00. "The iPhone 5 exhibits a great deal of similarity to the iPhone 4S in terms of component suppliers," said Andrew Rassweiler, senior principal analyst, teardown services, for IHS. "But beyond this superficial resemblance, there are some critical changes to product design and parts that enable major upgrades that improve user experience. These range from the faster applications processor, to the larger display, to the high-speed 4G LTE air interface. And beyond some of the high-profile changes that bring obvious benefits in performance and features, there are myriad upgrades and enhancements to virtually every component and subsystem in the iPhone 5." If you're interested in a seeing exactly what components go into the iPhone 5, check out this teardown. More details on the suppliers and components can be found at this link.